I planned on reviewing Midnight Nation by J. Michael Straczynski this week, but upon re-reading it, I realized just how gloomy it was. It’s a book that definitely deserves examination ... but I think Easter might be the better time to do so. Instead, let’s take a look at one of the Discworld graphic novels. If you’re unfamiliar with it, Terry Pratchett’s Discworld is a series of fantasy books whose primary purpose is to both parody and celebrate the numerous fantasy tropes. Pratchett is a prolific author as well as an extremely brave one; the fortieth Discworld novel is set to come out in 2014 even though he is dealing with early-onset Alzheimer’s Disease. There are a few different entry points to the franchise, but one of the most solid (and my personal entry point) is the novel Guards! 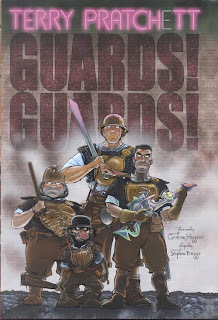 Guards!, adapted into a graphic novel by Graham Higgins and Stephen Briggs. This graphic novel is surprisingly rare, with new versions going for hundreds of dollars on Amazon; I was lucky enough to find my copy at Zaldiva Comics, an excellent smaller comic book shop and eBay retailer in Ft. Lauderdale. Only a few of the novels have been adapted into comics; sadly, Hogfather, Pratchett’s brilliant take on Santa Claus and belief in general, is not one of them. Guards! Guards! marks a major transition in the overall storyline of the Discworld novels. The previous seven novels were primarily about the incompetent wizard Rincewind, the cranky witch Granny Weatherwax, and Pratchett’s stern and surprisingly heroic version of the Grim Reaper. My personal favorite of these early books is Small Gods, a one-off set in the distant past which deals with how gods operate and how religions emerge and change. The key change in Guards! Guards! is the introduction of the City Night Watch of the City of Ankh-Morpork. By adding the elements of a police procedural and the Watch’s dynamic leader, the world-weary Sergeant Vimes, Pratchett was able to open up numerous new venues of storytelling. Many Pratchett novels have one central fantasy spoof at their core. 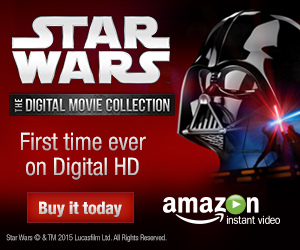 In this case, it’s the idea of the “dragon-conquering hero," in the vein of St. George or Arthurian legends. A group of evil men longing for the good old days when Ankh-Morpork had a king work to summon a dragon. In turn, they will set up a man to defeat the dragon and take over as king while they pull the strings behind the scenes. Mind you, Ankh-Morpork hasn’t had a king for centuries; it’s a nice jab at those who long for pasts which never really existed or which they don’t really remember. The Watch, meanwhile, has lost much of its power now that the city’s leader, Patrician Vetinari, has created a Thieves’ Guild to both keep the thieves happy and the citizenry safe. Into this situation comes Carrot Ironfounderson, a huge man adopted by dwarves who wants to see the law upheld to the letter. Pratchett throws some great twists in, with one in the middle dealing with the dragon’s fate being a personal favorite. You might notice that I’m talking more about the original book than the adaptation. That’s because Stephen Briggs stayed very true to the novel, occasionally to the graphic novel’s detriment. Pratchett has a very distinct and very verbose writing style, often taking a few pages to reach a point wrapped within a pun. Briggs leaves too many blocks of texts unchanged, so that some pages have paragraphs embedded within them. He does his best to put Pratchett’s numerous footnotes into the caption boxes. Pratchett also has a tendency to have action take place off-page and let the characters describe what’s going on. While this works in a novel, this really needed to be changed for a comic book. Mind you, I think this is the best outcome we could have gotten; Briggs literally wrote the book on Pratchett (namely The Discworld Companion and other related guides). In the hands of someone who wasn’t so familiar with the material, too much would have been changed and the feel of the original work would have been lost. Helping this feel is the artwork from Graham Higgins, which is just cartoony enough to take the edge off of the slightly darker portions of the book while still looking accurate to Pratchett’s ideas. At times, it looks a bit like Terry Gilliam’s animations from Monty Python’s Flying Circus. Most of the character designs match up with what I thought the characters should look like, although I always imagined that Vimes had a mustache and that Vetinari looked like Peter Cushing. Higgins’ dragons look especially excellent; once you know the meaning behind the opening pages and the “dragon space” they take place in, you can appreciate all the detail he put in. If you’re able to find a copy of this graphic novel version of Guards! Guards! for its cover price or lower, I would recommend it if you’ve already read the original. It’s not as bad of an adaptation as Seymour Chwast’s Divine Comedy (which is the Cliffs Notes of Dante with sketches of people in hats), but I still think the prose version holds up better. The novels themselves are very inexpensive and can be found at any bookstore. If Guards! Guards! gets you hooked, then I would also recommend Feet of Clay, Reaper Man and Thief of Time in addition to the aforementioned Small Gods and Hogfather. It’s been a crazy but fun year for me and Collected Editions in general, and I look forward to continuing my weekly reviews next year and beyond. Come back next week for a look at J. Michael Straczynski’s recently completed masterpiece The Twelve, followed by some more Marvel NOW! and some Spider-Man flashback tales as we head into February and the release of the Infinity hardcover. There is a Discworld graphic novels collection...this book might be in there! Unfortunately, the only graphic novels in that collection are "The Color of Magic" and "The Light Fantastic".